Double vanity bathrooms offer twice the personal space in a variety of styles. 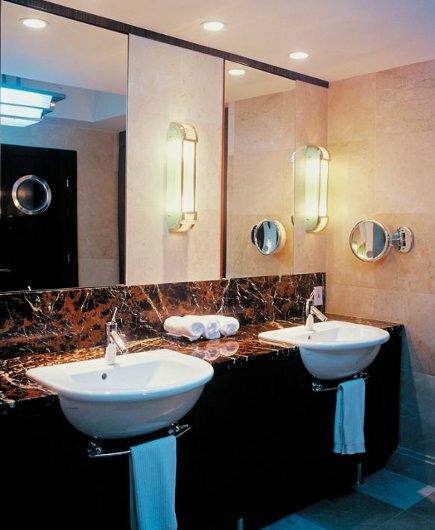 Double vanity bathrooms are designed for two. Presently, in our master bath, we have a pair of elegant pedestals with wonderfully large bowls. But we both might enjoy a little more “setting down” space which a double-size vanity with one or two sinks provides. One of my fixations is oversize cast concrete trough sinks set with a pair of faucets [top]. This one occupies the whole wall and deftly mixes a modern aesthetic — note the zero-radius (square) corners and contemporary pulls — with a rustic country wood look for drawers and doors. Windows over the sink sometimes sacrifice mirrors and these have shades that work in two directions to block out glare. However, no mirror in front of the vanity is not my favorite. Note there is no tile whatsoever in this bath — it is done. 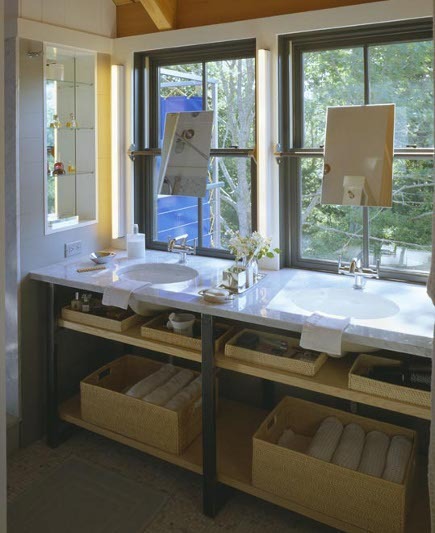 Another take on a double vanity bathrooms with a view has a casual feel despite fancier materials and a more formal, symmetrical layout. Each sink bowl is mounted under a single marble slab that covers a console boasting industrial-chic steel frame and legs. Console storage is open but well organized with sets of baskets sized to each shelf. Perhaps the most interesting feature – at least to me – is the artful placement of the tilting mirrors. Setting those rectangles into the frames of double-hung, two-over-two windows almost looks like artwork. Three vertical fluorescent wall sconces are another sleek but practical solution for folks who like very bright light. A floating vanity is one element of mid-century style baths. Lacking legs, it’s bolted to the wall for a cantilevered effect (think Frank Lloyd Wright). Large, square vessel sinks set on top of the deck raise the height of the basins conveniently and update the look. 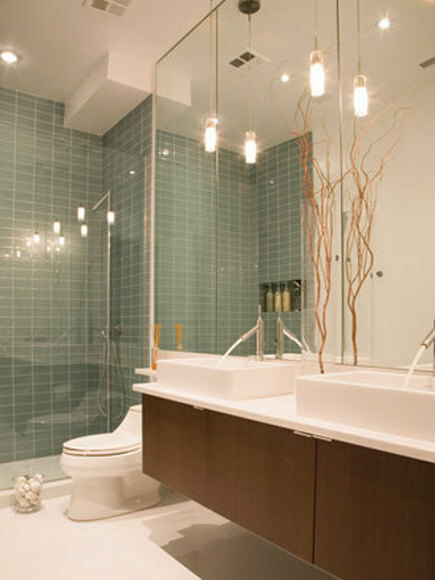 The mirrored wall behind the sinks doubles the bathroom space and adds glamor to the possibility of concealed storage. We’ve seen a great many apron sinks in kitchens over the past ten years but Duravit’s semi-recessed D-shape bathroom sinks – which push out towards the user – are a less common designer favorite. For this masculine bath with a distinctly hotel feel, Miami’s Pepé Calderin took advantage of the sink bumps, letting them pop against java-tone wood vanities and rich chocolate-hued marble. 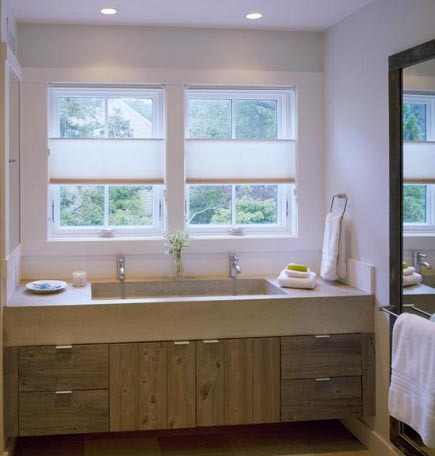 A curved towel bar below each basin helps to emphasize the shape. 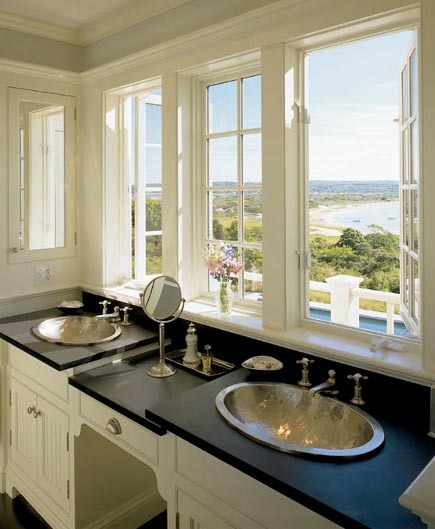 With its white, Victorian-style white cabinets, soapstone counters and hand-hammed drop-in sinks, I think of this traditional black and white master bath as the equivalent of the “Something’s Gotta Give” movie kitchen. It could easily be on the second floor of that house, right? And the low center section creates a sweetly old-fashioned dressing table – the better to enjoy a spectacular view. Dual vanities have never been a draw for me when looking at a house, because I’m so weird about needing to use the bathroom by myself. God forbid my husband catch me tweezing. I prefer him to believe that I’m just always effortlessly pretty. Staying at my parents home where there are separate vanities in the upstairs master(our room) showed me the error of my ways. While I still wouldn’t share the room with him, it’s nice that his mess(whiskers in the sink) were contained on the other side of the room until the end of the week when I was ready to clean his side. Hubby and I are often in the bathroom together, but I’ve also never been big on double-sink vanities. I guess the last place we had them, one sink was so much better situated and comfortable to use, even though 8 of us used that bathroom, that one sink was superfluous….and just another sink to clean, since even barely or not used sinks get grimy. Each having space to their own side of one sink would be more important to me. Right now we share a 4 ft vanity with centered sink, so have neither a sink or much counter space to ourselves. BUT I could LOVE a set up like you show in the first photo. One big sink would be a great solution for us. I hate the limitations of little vanity sinks anyway. This big sink would address 2 problems for me at once. This is the first place we have lived with double sinks in the master bath. Love love them. Hope to never have to live with one sink again. Jane, I really like the rough wood and concrete trough sink. The last one would work for me too. My husband and I always use the bathroom privately. If we want to use it at the same time, he usually uses the guest bath. I let my 1st husband see me primp but I don’t want to do that again. We both like our privacy. LOVE LOVE LOVE the trough double faucet sink. Simply stunning. We’re currently designing our new MBR suite and I will DEFINITELY share this one w/hubs!